Palm City – FL – The 144th Run for the Roses! 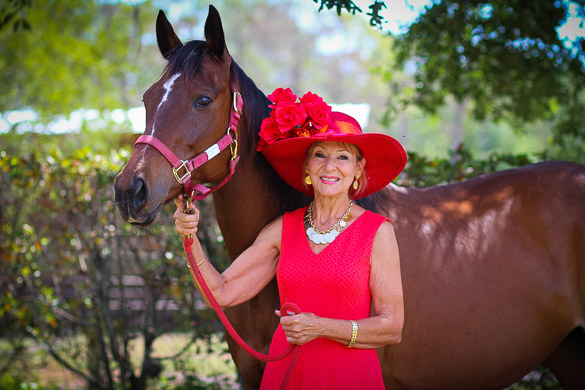 on May 5 is the perfect occasion to party with the horses at the Equine Rescue and Adoption Foundation in Palm City. The beautiful ERAF Community Center and outdoor pavilion will be the place to be from 4:30 pm to 7:30 pm. The horse rescue organization has joined together with Caring Children/Clothing Children to host a stylish Kentucky Derby Party with lots of fun activities. Tickets are just $50 per person. Guests are asked to bring a new or gently used book to donate to 4Cs. Live streaming of all the pre-race and race action at Churchill Downs as well as some friendly wagering will be available inside the air-conditioned center. Jon “Johnny Debt” Prestage will provide live music to enjoy as you sip the signature cocktail, a margarita, a nod to Cinco de Mayo. An open bar and light hors d’oeuvres will be served. Larry’s Landing food truck will provide heartier fare as well. Another fun activity is the opportunity to have fairy hair accents by So Very Fairy specialists. The Kentucky Derby is known for the fashionable hats many race enthusiasts wear. Male and female guests are encouraged to wear their own derby hat or perhaps create something special to participate in the Derby hat contest. While at the Equine Rescue and Adoption Foundation guests will have the opportunity to meet some of the 40 horses on property and tour the barn. Don’t miss seeing the one-month old foal! A silent auction, 50/50 raffle and the mini-horse kissing booth will provide be set up for guests to enjoy. All proceeds will benefit 4Cs and ERAF. The mission of 4Cs is to provide top-quality gently used clothing, new shoes, socks and underwear and a helping hand toward literacy to under privileged children in Martin County. The Equine Rescue and Adoption Foundation, Inc. is a non-profit 501(c) 3 organization devoted to the rescue, rehabilitation, re-education and adoption of abused, slaughter-bound, abandoned and neglected horses. The organization was founded in 2000. ERAF is located at 6450 SW Martin Highway, Palm City. For details and to purchase tickets contact the 4CS at 772-221-8777 and 4cmartin.org or ERAF at 772-220-0150 and eraf.org.